This May Be The Largest Private Donation To Fight Ebola : Goats and Soda Philanthropist Paul Allen is giving at least $100 million to support health care workers battling Ebola. Here's a look at his goals — and at contributions from other charitable groups. Direct Relief has been shipping medical supplies to West Africa. In what may be the largest donation yet from a private foundation to the fight against Ebola, Paul Allen, one of Microsoft's cofounders and a philanthropist, has pledged at least $100 million to help health care workers contain the current outbreak. Part of the funding will cover the cost of safely evacuating international aid workers from West Africa if they get infected. In a statement, Allen says the lack of medevac transport is one of the key challenges in recruiting medical professionals to the three hardest-hit countries, Guinea, Liberia and Sierra Leone. The donation will also help the University of Massachusetts Medical School train and send medical workers to Liberia, as well as provide decontamination and lab equipment. But the Ebola outbreak isn't a one-man task. Allen has called on the international community to follow his lead. To that end, he's set up TackleEbola.com, a platform where individuals can support specific efforts such as building hand-washing stations and helping orphans who've lost their parents to Ebola. "Charities and individual philanthropies have given generously and they can make a big difference," President Obama emphasized yesterday during his announcement of U.S. plans for addressing Ebola. Indeed, one nonprofit has had a huge impact from the start of this outbreak. Doctors Without Borders established the first treatment centers back in March after officials confirmed that the virus had killed 59 people in Guinea. The group's president, Dr. Joanne Liu, has been critical of the international response, calling it "too little, too late." Now, with the outbreak surging in West Africa, nonprofits and philanthropists are ramping up their efforts. It's an unprecedented move for an organization that has largely focused on long-term initiatives to combat diseases that kill millions each year. But the contribution isn't out of line with the overall mission, says CEO Susan Desmond-Hellmann. "Our guiding principle is that all lives have equal value," she tells Goats and Soda. "We were struck by the inequity that is so visible, how these individuals in West Africa are not able to access health care." The decision to make such a large contribution came, Desmond-Hellmann says, when it became clear that "this was more than an outbreak, and a true health crisis." The Gates Foundation had previously donated $2 million to the World Health Organization and UNICEF to support anti-Ebola efforts. Media coverage has motivated other nonprofits. "The more something is present in the news, the more likely we are to take action," says Dune Ives, co-manager of the Paul G. Allen Family Foundation. The "crescendo" of news in the past few weeks has pushed Allen to do more, she adds. The foundation donated more than $15 million within the past week: $9 million went to the Centers for Disease Control and Prevention to establish emergency centers; $3.6 million went to UNICEF to airlift 50,000 protection kits to Liberia; another $3 million went toward partnering with Airlink, a nonprofit organization that links NGOs with partner airlines for passenger and cargo transportation. That's on top of $2.9 million donated in August. It's not only money that's needed. A team of doctors from Partners in Health, a Boston-based nonprofit committed to providing basic health care to the world's poorest regions, has just arrived in West Africa. Co-founder Paul Farmer and other staff will work with two local organizations to lay the groundwork for a two- to three-year project to deal with Ebola. They're recruiting additional volunteers, including physicians and nurses. This Saturday, Direct Relief will charter a private jet to send its 11th shipment of supplies to Liberia and Sierra Leone during the outbreak: $5.8 million worth of protective gear, gloves and medicine, weighing in at 100 tons. The California-based medical aid group has been providing emergency medical supplies for 66 years. This latest shipment will be its largest ever, says CEO Thomas Tighe. "Someone needed to do it, and we realized that was us," Tighe says. His group already had the materials, it had partners in Africa, and, he says, "We know how to do it." Tighe says governments must take the lead in a crisis like this. But nonprofits can play a complementary role. "Those big wheels of government — they turn slowly," he says. "Nonprofits are sort of the smaller wheels that turn faster." 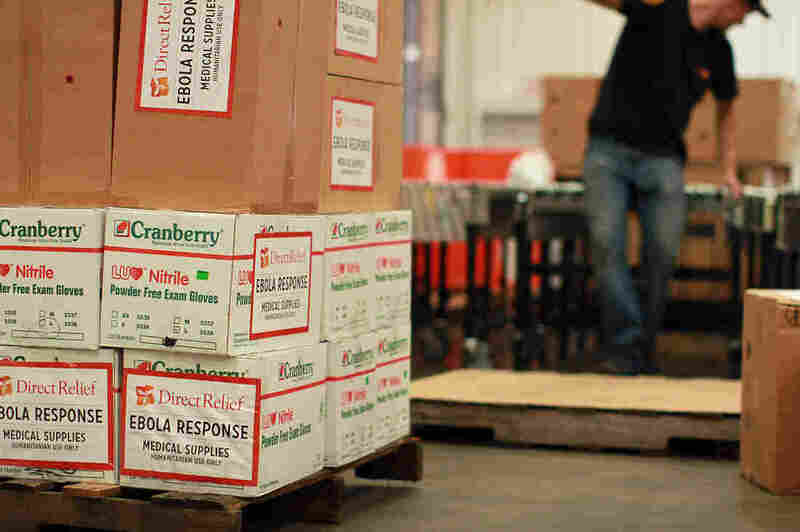 In Modesto, Calif., Relief Inc. has been collecting medical supplies since the beginning of the outbreak, filling a 40-foot shipping container that will make its way to Liberia. Relief Inc. has largely worked to better the lives of women and children in war-torn Liberia. When the outbreak hit, the group began gathering protective gear, disinfectant and other supplies. Wrangling donations and finding an airline to work with hasn't been easy, says CEO Phebe Dennis-Fortt, who was born and raised in Liberia and still has family there. Its contribution may not rival the size of Direct Relief's, but every bit counts — especially for Dennis-Fortt. "We were at war for years," the 53-year-old says. "We were finally starting to see some peace, and people were still coming up with hope." Then Ebola came "out of the blue," and again she had to watch her community suffer. "It's just too much pain, and you want it to go away," she says. "But it doesn't." A previous version of this article incorrectly said that Airlink was a nonprofit airline. Airlink is a nonprofit organization that links non-governmental organizations with partner airlines for passenger and cargo transportation.